Fell is the new release by acclaimed literary novelist Jenn Ashworth (Sceptre 2016). On one hand it’s a dark tale of love and loss narrated in first person plural and omniscient third person by the ghosts of those long dead. On the other it’s an intense exploration of power and the struggle to attain and maintain it in interpersonal relationships. But, perhaps more than either of these, it’s an elegy for a life unnoticed. The story centres on the lives of Netty and Jack, who become undone both physically and mentally, and their relationship with a young man who provides a particularly aggressive form of hope. Desire and desperation meet and lay bare the raw howl of humanity. The story dances in time and perspective but every leaf-like dart and flutter is clearly signalled; we always know where we are and who we are. Throughout the story runs the thread of decay in a beautifully handled metaphor of house and home and the dark and brooding destructive power of nature. This darkness can be overwhelmed but never removed – unlike the Sycamores which dominate the skyline – and it exists in every mixed motive and flare of ego, every doubt. Every character in this novel is uneasy and the unease grows in pace with the disease until we reach a fraught crescendo. There is life after death, both literally and figuratively, but there is a sense of great cost. Jenn Ashworth does a superb job of evoking the spirit of the age in this novel. The descriptive passages ground you in a very real world, against which backdrop the preternatural sings. The relationship between Netty and Jack is entirely believable and the strengths and weaknesses of each character lead to a carefully nurtured sense of emotional investment. The story may not be entirely born of its landscape but it breathes it, lapping at the edges of our perception like the tides. Grange-over-Sands and Morecambe Bay show an expanse of horizon which provides a counterpoint to the increasingly insular nature of the Clifford home. There are wonderful moments of dialect- plooks, moider and mollycot – when one of the characters is ‘gattered’. A moment of unguarded voice which raises the question of whether any public face is a true face. Is every voice a decision, an attempt to be accepted? For some it will be the child, forever on the edges of the adult drama, putting aside her own voice out of duty and love. For others it will be the young man, at once observed and unobserved, damaged and damaging, desirous of anonymity and fame. Both, cursed with the same burden. Jenn Ashworth’s first novel, A Kind of Intimacy, was published in 2009 and won a Betty Trask Award. On the publication of her second, Cold Light (Sceptre, 2011) she was featured on the BBC’s The Culture Show as one of the UK’s twelve best new writers. Her third novel The Friday Gospels (2013) is published by Sceptre. She lives in Lancashire and teaches Creative Writing at Lancaster University. 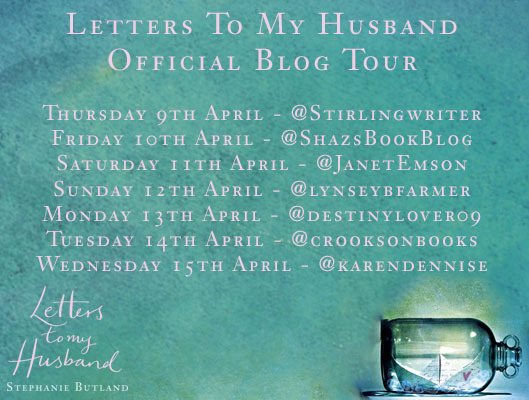 Today I have the pleasure of heading up the Blog Tour for debut novelist Stephanie Butland. ‘Letters to my Husband’ is my first novel (it was originally released in hardback as ‘Surrounded By Water’). It’s the first of three novels set in a small town of Throckton, and it’s a story about loss, love and the unexpected places that life can take us to. It begins when Michael, a well-respected police office, drowns, saving a teenage girl who had fallen into a lake on a cold January night. We follow his widow, Elizabeth, as she struggles to come to terms with his death, and the shocks and surprises that come to light in the aftermath of his death. This novel had a prologued journey from my head to the page to publication. It began as a comic novel about a committee – I had made an impulse decision to take part in Nanowrimo in 2011 and hadn’t really given a lot of thought to what I wanted the book to be about. 20,000 words in it stalled, and an insightful reader suggested that the committee – which I had thought would be a great way to bring together a group of diverse characters – might be holding the story back When I took the idea of the committee away from the book, I found that the real content was in Elizabeth’s bereavement. So I started again, writing a series of interlocking first person narratives which told the story much better – although once the book was bought by Transworld, my editor suggested that a third-person narrative would be even more effective. She was right. But the letters of the title have remained unchanged since the very first draft. I’m now writing my fourth novel. I’ve learned a lot about the writing process, and the way I write is now better organised, and less wasteful of words, which is a great relief ( there are few things more dispiriting than spending 6 hours working on a book and ending up with 18,000 words less than you started with). But ‘Letters to my Husband’ taught me something really important about writing, and it’s this. Start somewhere. Write something. Keep going. If you do that, you’ll get there eventually. Letters to my Husband by Stephanie Butland is published by Black Swan 9/4/15. After the first few breathless sentences you relax into the arms of a storyteller who knows his craft, not that this is a gentle ride. Thought darts like a swift, weaving and tracing an order in the blue. This novel is about order and pattern, the natural and the constructed, the concrete and the ephemeral. It is also about purpose and permanence. We are involved in a literary Brownian motion, skipping and colliding between stories, between lives. It remains to the reader to decide which if any of these lives is altered in the observing. The narrator asks the same question of his own observations. Does it ultimately matter? Matter is dual intent. The writer is building a microcosm of experience for the purpose of understanding. He does this by deftly layering first person accounts of experience and bleeding them into each other, at first precisely and obviously, as if to teach us the rules of engagement, and then freely and with added pace. My suggestion would be to trust each wave, trust the flow of thought. It is taking you ever onward. Flow is such a gentle term for what is, in places, a flood of thought. Each of the minute glimpses of a life could be unfolded into a complete story. Something which won’t surprise you if you are familiar with David’s short story work. And although you may be tossed in the current but you won’t be overwhelmed. This is gifted, beautiful writing. I defy you not to learn something. Strange creatures, writers. You will seldom meet a group of people so acutely aware of the world, aware of the place where they fit or, more often, don’t fit. We squeeze ourselves into boxes called genres because marketing likes a good box. They make things easier to package and shelve. They make them easier to sell… to describe. I jest but it’s a dark one, because, whatever you are as a writer, you are not a genre. You are not even who you were last year and you won’t be the same person next year. You are Becoming. What are you becoming? Well, I don’t know it’s your journey. You might pass through several phases of writing and many genres. And then you find a genre where you settle for a while and it will be the right one for who you are at the time, because you are not a genre, because you are Becoming. It is part of the thrill of being alive to watch people Become. And who we become is influenced every day by who we want to be. We don’t always get what we want and we seldom if ever get what we expect but we all get to change, to develop, to be new. I don’t know the final destination of the journey. I haven’t had the opportunity to peep at the last page of my story and I don’t think I would want to. I am enjoying Becoming and I look forward to seeing you Becoming, for all the days of my life.